Gold has gone up for 12 straight years in a stealth market. In the last ten years gold has had a compound annual growth of 20.5%. This is an absolutely outstanding return but investors should not look at gold as an investment but as money. Gold reflects governments’deceitful actions in totally destroying the value of paper money by printing unlimited amounts of it. With gold up 7 times since the bottom in 1999, is it too late to jump on the Goldwagon? 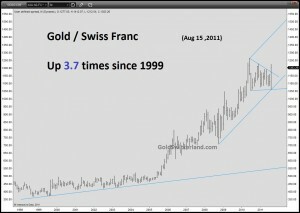 There are many ways to project how high the gold price can reach. Adjusting gold for real (not the published, manipulated) inflation the price would be circa $7,500. At the recent GATA conference, Adrian Douglas put forward a target of $53,000 an oz based on M3. He said that that out of every 33 oz of gold traded 32 oz are paper gold, which would lead to a price projection of $53,000 also, if all trading were backed by physical gold. 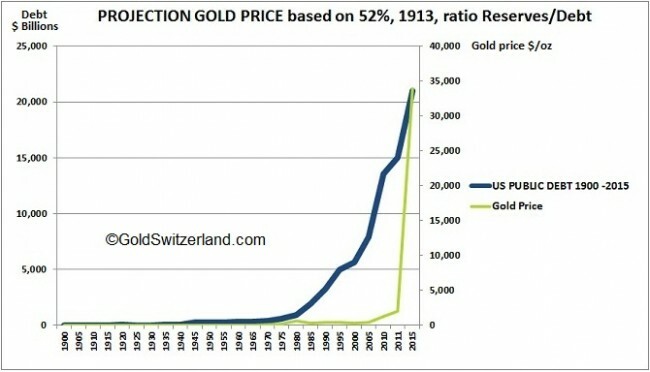 The following chart shows where gold would be if the US gold reserves were at the same percentage (52%) of us debt as in 1913 when the Fed was founded. Gold would then be $27,000 today and going up to $33,000 in 2015 with a projected increase in debt of $ 6.5 trillion (6.5T). All of the above projections are subjective and therefore somewhat arbitrary. 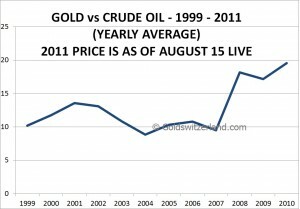 However, whatever method is used, gold is undervalued on any measure. We are not just talking about a substantial undervaluation but more importantly that paper money is likely to be totally destroyed in the next few years with the gold price reflecting this obliteration. It is absolutely impossible to forecast how much money will be printed but the flood of paper could lead to many zeroes being added to the gold price just like in any hyperinflationary economy. For example, in 1923 in the Weimar Republic gold reached 100 trillion marks. Gold (and silver) is a critical asset to hold in order to preserve wealth against such a hyperinflationary destruction of paper money. Store the gold outside the country where you are resident. Store the gold outside the banking system in vaults with no US connection. Gold has recently made new highs against most currencies. 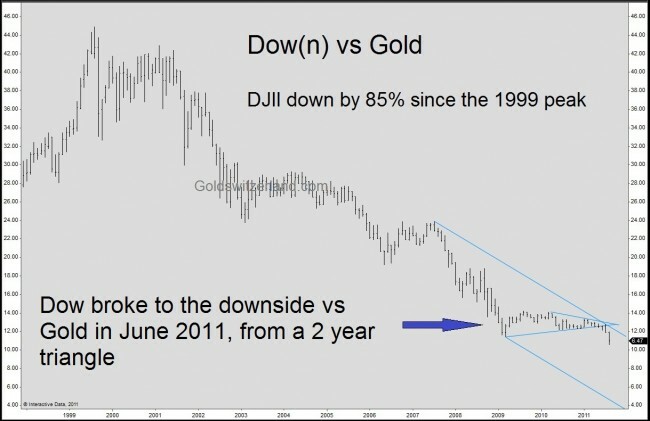 In addition, after longer consolidations, the Dow is breaking down against gold (down 85% in 12 years), and gold is breaking up against both Oil and the Swiss Francs. These break outs are potentially very significant and will most probably lead to a strong up-move in the gold price in the next few months. The world is in an absolute mess, economically, financially, politically and morally. And let me be very clear; this has been evident for at least 10-15 years. The only thing that has not been clear is how long governments and central banks could deceive the people by kicking the can down the road in an endless creation of worthless pieces of paper that they call money. The lone voices of some market analysts, forecasting that the manipulation and mismanagement of the people’s wealth would end in disaster, have for long been silenced by the establishment in order to betray the gullible masses. Intellectually dishonest and corrupt politicians and bankers have devised a system which has created perceived, debt-based wealth for the people whilst buying votes and generating massive wealth for the bankers. But this Ponzi scheme is now coming to an end. 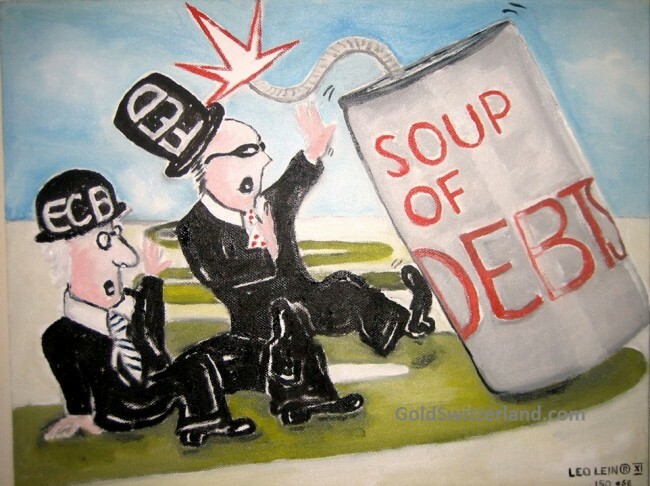 When printed money can only be repaid with more printed money and when there are no buyers for the worthless debt instruments created by governments except for the government itself, then we have reached the end of the road with a “can too big to kick”. Two years’ ago in the summer of 2009, I wrote an article called “The Dark Years Are Here” which outlined the likely consequences of the excesses of the last century. Let us just look back to understand the historical perspective. Throughout history there have been regular periods of credit creation and money printing resulting in a collapsing currency. This happened for example as the Roman Empire was disintegrating starting circa mid 200 AD. So destruction of money is not a new phenomenon as Voltaire said already back in 1729 “Paper money eventually returns to its intrinsic value – ZERO”. But so far in history these events have normally been limited to one country or region. Never before in history has there been a financial system which has made it possible for the whole world to simultaneously create unlimited amounts of debt. 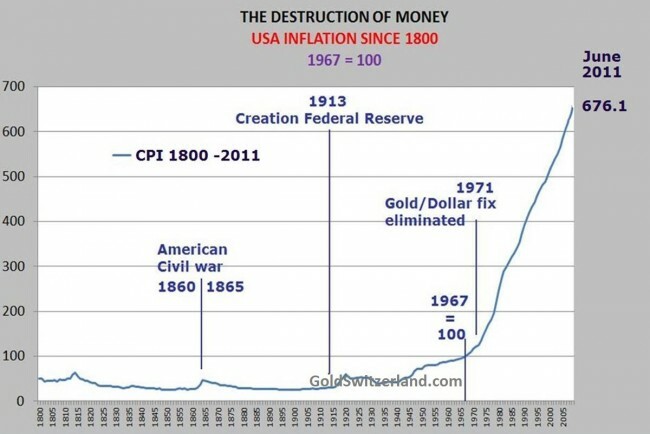 The graph below shows the effect of this money creation in the US but the same applies for many parts of the world. Between early 19th century and early 20th century there was virtually no inflation. A house cost the same in 1910 as in 1810. But then in 1913 the fraud in the financial system started. Private bankers in the US created a private central bank owned by the bankers and for the benefit of the bankers. This was when the Federal Reserve Bank was created with ultimate power to print money and thus destroy the value of paper money. This was the most perfect way for private bankers to control financial markets with the total blessing of the government. Thus started a worldwide credit manufacturing scheme that eventually will lead to a collapse of the financial system. In order to inflate this bubble even faster, Nixon abolished gold backing of the dollar exactly 40 years ago on August 15 1971. Nixon should not have been impeached for Watergate but instead for destroying the world financial system and world economy for many generations. Since the closing of the gold window in 1971, total US Debt (private and public) has gone from $10 trillion to almost $60 TRILLION today. What has taken place in Washington in the last few weeks is absolutely disgraceful. Irresponsible politicians have been spending months bickering about the debt ceiling and disagreeing until the very end how to solve a crisis that will bring the US down. It is appalling that they, out of self-interest, take this issue to the wire when the country is in the process of going under. The whole procedure is only about political posturing and buying votes rather than caring about the good of the country. 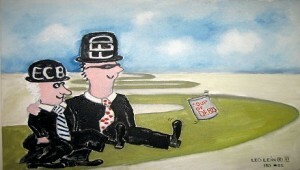 The politicians are rearranging the deckchairs on the Titanic whilst the country is sinking into the abyss. The debt ceiling is totally irrelevant. US Federal debt has increased every year since 1961. Thus for 50 years the debt has gone up yearly and during that time the debt ceiling has been raised 79 times! The real issue is that the US is bankrupt and raising the debt ceiling only exacerbates the gravity of the country’s problems. What they should have agreed instead is a substantial reduction of the debt ceiling. But that doesn’t buy any votes. Another debt rise agreed of $2.4 trillion (in two stages) will probably last a year at best. Proposed spending cuts of $2.1 trillion will almost certainly never happen but if they do they will be after 2013 and probably mainly take place at the end of a 10 year period starting from now. In the meantime the debt is likely to increase by tens of trillions of dollars. Sadly it doesn’t matter what the reckless politicians do. This situation is unsalvageable. 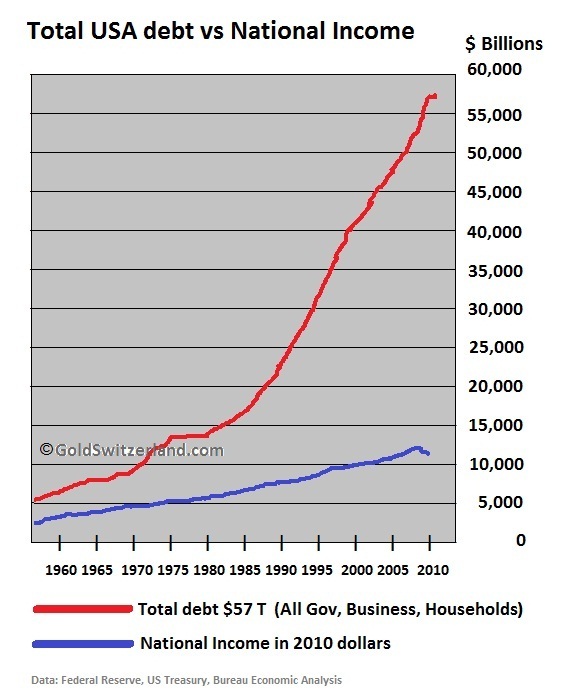 The exponential growth in debt in the last 100 years has created a false prosperity by mortgaging the future for many generations for the benefit of current consumption. Wealth based on credit does not only steal from future generations but creates the wrong values based on debt, greed and materialism. Values such as honesty, integrity, courteousness, righteousness, respect and kindness have totally disappeared in large groups of the population. And the family is no longer the kernel of society. Recent social unrest and riots in the UK is an inevitable consequence of this social decadence. With youth unemployment at 25% in many countries and as high as 50% in the major cities, this problem will become unmanageable in the next few years. Failing economies and empty stomachs will exacerbate the situation dramatically. 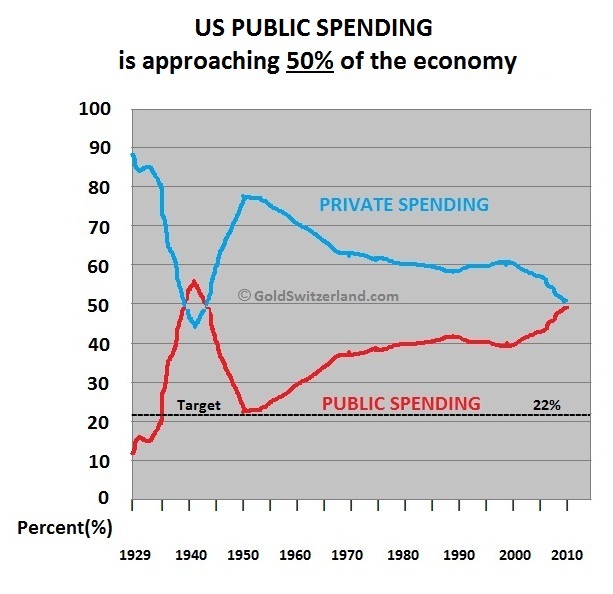 Also, since government (and the bankers) control the system by creating money out of thin air, major resources in the economy are transferred from the productive and innovative private sector to the totally inefficient, unproductive and bureaucratic public sector. The public sector only consumes wealth and does not produce anything. By taking invaluable resources from the private sector, consuming most of what it takes and then giving the rest to the most unproductive part of society (the weak, sick, unemployed, work shy etc. ), government perpetuates the worst part of the economy and destroys the ability of the nation to expand. The point I am making is that the last 100 years are exceptional in history because this period is based on an unprecedented worldwide debt creation and money printing but not on the natural laws of supply and demand or saving and investment. Exceptional things never last since the laws of nature can only be broken for a limited period. And we have now come to the end of the world’s largest, government sponsored, Ponz scheme ever. The consequences will be felt in all aspects of society and most likely last for a very long time, at least for several decades and maybe longer. Add to the US debacle, the problems in Europe which are almost of the same severity. The European money markets are now starting to seize up as pressure mounts on the Italian, Spanish and French banking systems. 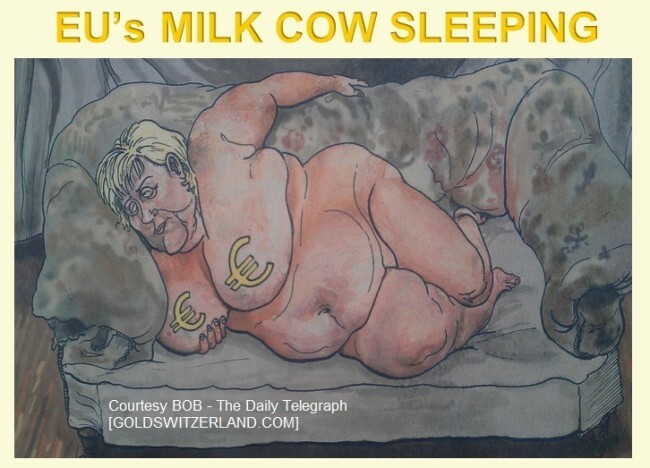 It will be impossible for the milk cow of Europe to continue to support all the weak European countries. Initially the EU will accelerate the money printing because of political pride. But like all grandiose political unions, the EU will eventually break up. The world is now staring into the abyss and we are most likely entering the Dark Years which I wrote about two years ago. The consequences will almost certainly be unlimited money printing and a hyperinflationary depression. Copyright © 2010 GOLDSwitzerland. All rights reserved.